Whose Top Corporate Donors Are Among The Most Hated Companies In America? Oh really? So which companies is the article, sourced to the ultra-rightist Washington Free Beacon, referring? They are indeed a collection of mostly financial institutions that have deservedly earned the enmity of the American people. Companies like Citigroup, Goldman Sachs, JPMorgan Chase, Morgan Stanley, and Lehman Brothers. All of these enterprises played a role in plunging the nation into the Great Bush Recession of 2008. Also on the list is 21st Century Fox. 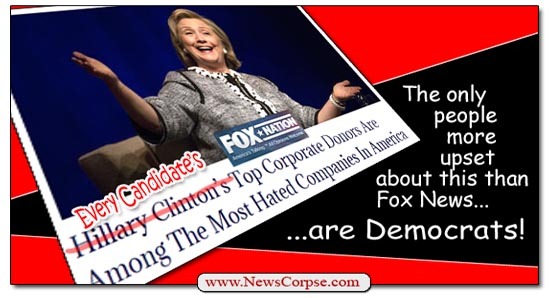 It’s kinda fun to see Fox pointing out that their own corporate parent is so hated by the American people. However, when the substance of this story is examined, there are some serious flaws to the premise. First of all, the survey (pdf) that was cited in the article was conducted by Harris Interactive. It was never intended to identify “the most hated companies in America.” What Harris was studying were 100 of the most visible companies and ranking them by what Harris called their “Reputation Quotient (RQ).” Of course there are thousands of other companies in the country that may be hated much more but were not a part of the survey. The RQ is an amalgamation of several factors including the firm’s emotional appeal, social responsibility, workplace environment, and financial performance. Not all of the criteria reflect on merely the public like or dislike of the company. What’s more, every company in the survey scored above 50, which suggests that none of them are hated with much passion. In prior years there were some, like Halliburton, BP, AIG, and Bank of America, that did fall below the 50 threshold. Nevertheless, no company wants to be on the low end of this list even if it isn’t that low. The big problem with the story is that it singles out Hillary Clinton as the recipient of donations from these allegedly despised outfits. But in truth, just about every candidate for political office receives donations from these corporate ogres. And for the most part, Republicans are generally the beneficiaries in much higher amounts. So what is the point of the article. Is it to criticize Clinton for taking money from the same dirty corporate entities that Republicans take money from? If so, there is a group of Americans who would wholeheartedly agree and share in the criticism. 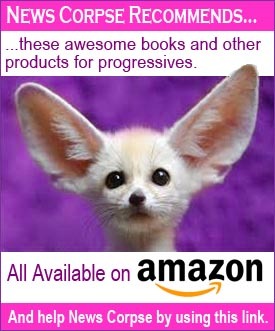 They are called Democrats. The passion that is driving the campaign to draft Sen. Elizabeth Warren as a challenger to Clinton is fueled by this very criticism. Furthermore, while many in the Democratic Party have been working for years to remove this sort of tainted funding from the political process, Republicans have fought tooth and nail to continue and even expand it. A bright, flaming red, festering example of this is the pledge made recently by the Koch brothers to raise and spend nearly a billion dollars in the 2016 election cycle to buy power for their political puppets. Meanwhile, there are two Super PACS founded by well known liberals aimed at eliminating Super PACS: MIT’s Lawrence Lessig’s Mayday.US and George Soros’ son Jonathan’s Friends of Democracy. So if Fox News and the Free Beacon and the GOP want to get on board with the bashing of greedy, power-hungry corporations (who are not people, no matter what Mitt Romney and the Supreme Court say), and prohibiting them from corrupting American elections, they are most welcome. Unfortunately, it is more likely that the these right-wingers are just taking wild swings at Clinton and only hope to slander her, rather than to make a principled statement about the influence of corporate money. 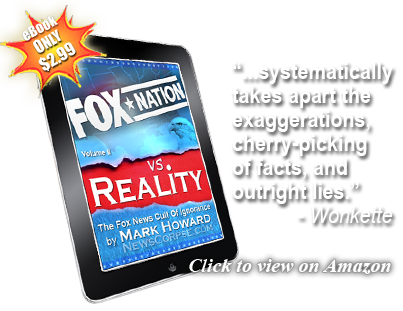 ← When Will Fox News Fire Bill O’Reilly For Lying About Combat Duty?